Aaron Levie is the Co-Founder and CEO of Box, a company that specializes in helping companies securely share and manage their information. The company was started back in 2005 while Aaron was in college. Back then it was him and one other person, but now 14 years later they have over 2,000 employees who serve 90,000 customers around the world. But the road to success wasn’t easy. Aaron dealt with a lot of rejection along the way. When they were initially trying to start Box they received around a dozen rejections, but instead of giving up Aaron kept a positive attitude. He claims, “that was a good week for us, what are you talking about? That was like wow! The fact that people responded saying no was actually a good thing. We were like, “All right, we finally got a rejection””. This is what makes him a great entrepreneur, he held to his convictions and never gave up. When it comes to leading Box, Aaron works hard to create a culture of openness and transparency. He explains that because the company began with four friends who were used to calling each other out on bad ideas, they were able to have transparency and candor built into the fabric of the founding team. Now they carry on those values even with 2,000 employees. They want an organization where employees can tell the CEO “you’re wrong”. When asked how his leadership style has changed over the years, Aaron says it has been an evolution that has taken time. He is so passionate about everything that Box does, in the beginning he found it hard to not get involved with every little detail, but he has learned what to delegate, what to hire someone else for, and what areas he is still willing to “pull the CEO card to kind of push on”. In today’s constantly changing world, it is difficult for businesses to stay relevant. Aaron explains that one of the biggest challenges companies face is having to not only be the best digital experience in their own industry, but having to be the best in any industry. With this digital age where everyone is so connected people have more choices than ever before and they are going to compare your company against all the rest. Aaron says, “Never before did I compare my banking experience to my retail experience. And yet today, if my online bank isn’t as good as Amazon, then I don’t think that you’re a modern bank.”. 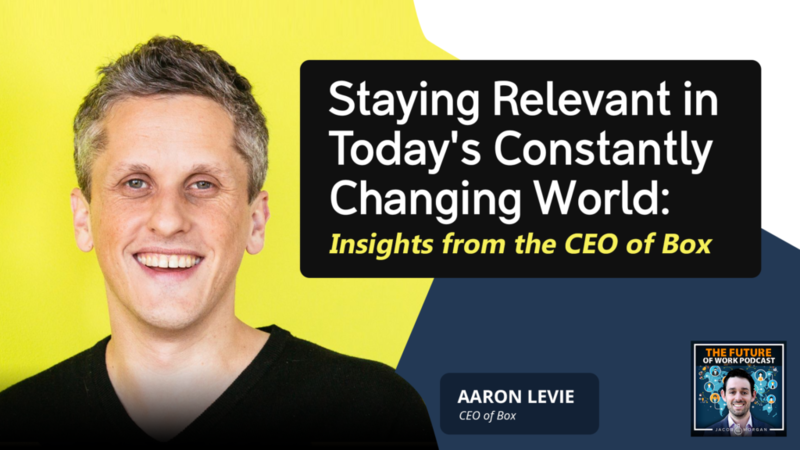 In order to stay relevant Aaron believes as individuals we need to be flexible and adaptable in order to stay relevant and as organizations we need to stay focused on our customers. We need to help them solve a problem. Otherwise you will not exist in the future.